Every year, winds whip through Las Vegas and Henderson, potentially damaging solar pool heating systems. It is very important to have your solar pool heating system maintained to prevent wind damage. Las Vegas “Power of 3” solar project by Suntrek Industries. 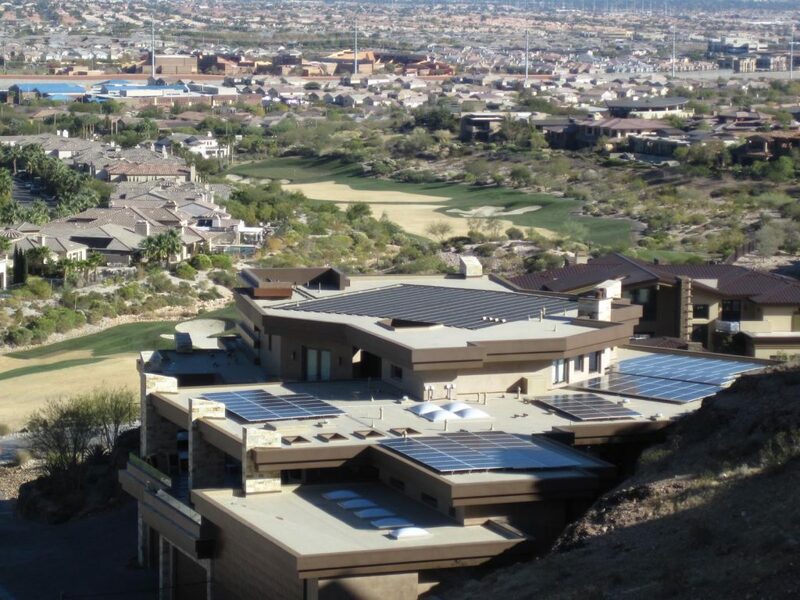 Suntrek provided this homeowner with a custom-designed solar pool heating system, solar electric system and solar water heating system. Have an annual check up by your solar energy company. Make sure all your roof attachments are solid and secure. If your system should be winterized to protect from freeze damage, have your solar collectors drained and your system turned off. What condition is your roof in? Keep in mind that your solar system is attached to your roof and if your roof is in poor condition, the attachment system can be jeopardized. If your roof needs to be replaced, coordinate the removal and re-installation of your solar pool system with your solar energy company.